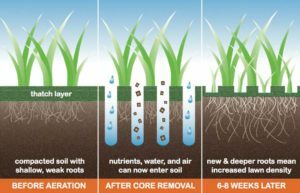 Aeration involves perforating the soil with small holes to allow air, water, and nutrients to penetrate the grass roots. This helps the roots grow deeper and produces a stronger, more vigorous lawn. Aeration allows your lawn to rejuvenate and heal from excessive drought and foot traffic while promoting healthy soil and thatch decomposition. 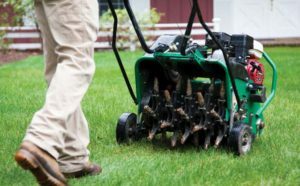 The best time for aeration is during the growing season when the grass can heal and fill in any open areas after soil plugs are removed. The fall is an ideal time to aerate your lawn. Removing small plugs of turf breaks up thatch, the layer of dead grass that builds up on your lawn. 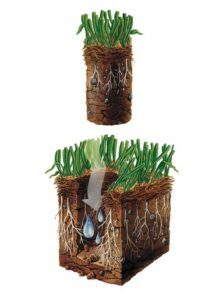 The process of aeration allows more water, oxygen, and fertilizer to get to your lawn’s roots. Grizzly Bear Lawn Care aeration services promote positive conditions for turfgrass growth and development. The process helps air and water penetrate deep into the soil, which encourages deeper root growth and better turf quality. Overseeding is another important part of lawn maintenance and is the process of planting grass seeds directly into existing turf without tearing up the turf or the soil. Overseeding can improve your lawn density and introduce new seedlings into your existing turf. Overseeding also enhances the ability of your lawn to withstand stress and fight disease to insects. Soil to seed contact is often achieved by combining aeration with overseeding (highly recommended). By spreading new grass over existing turf, you are thickening your turf, enhancing its color, and preventing unwanted grass and weeds. The experts at Grizzly Bear Lawn Care are happy to provide overseeding services along with our aeration services. 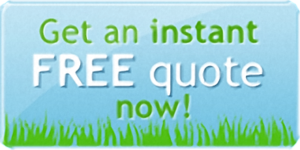 Contact Grizzly Bear Lawn Care to learn more or to schedule a service.